Every year as we fire up the barbeque in the summer, we might not be aware of the thousands of injuries, fatalities, and fires that are caused due to outdoor grills. In order to enjoy a safe, incident-free outdoor meal experience, it is important to educate ourselves on the crucial points of grilling safety. Apart from this we also need to know how to equip ourselves with the right tools for preventing and handling any potential hazards. In this article we’ll have a look at the basics of safe grilling habits and techniques. While it may be a bore to flip through the entire manual, this one simple step can go a long way in preventing mistakes. Beyond the assembly instructions, pay special attention to usage advice and safety tips. If there seems to be something wrong with the grill alert the manufacturer instead of attempting to use the grill . Their information is usually available in the manual or on their website. No matter how small a grill might be it should always be used outdoors. The key is to use it in an area where smoke and emissions can freely escape. This means that it isn’t even safe to use it in an outdoor tent or similar enclosure. The reason for this is because grills create carbon monoxide. The gas is virtually undetectable but fatal for humans and pets. Another important reason to use grills in a well-ventilated spot is to avoid sparks and cinders from setting materials or plants on fire. Grills have the potential to cause much danger. They contain hot coals, searing metal racks, heavy parts, and might be connected to a propane tank. To avoid any of these items falling over and potentially causing an emergency situation, owners should take every effort to secure the grill. Keep it on a flat, stable ground area. It is a good idea to place a few heavy rocks around the legs especially if there are wheels to prevent the grill from accidentally being tipped or pushed. Take the time to research your area’s regulations and codes about outdoor electric appliances. This is not only to avoid trouble with authorities, but more importantly it helps to avoid dangerous situations. When electric cords are required, wire them in a way where they are protected from water. It is best to place them in areas that do not receive heavy traffic. Food cooking on a grill tends to splatter and sizzle. By using utensils with long heat-safe handles, grill owners can prevent getting burned. Never reach for food on the grill with bare hands or with standard table utensils. Long tongs with serrated edges are extremely helpful since they can catch and hold on to the food better, to avoid accidental dropping. Long, flowing clothes can easily catch on fire if a person reaches over a grill. While it is important to be fully clothed while grilling, it is equally crucial to wear the right clothes. Roll up shirt sleeves above the wrist and make sure they do not hang down. An apron is handy for protecting skin and clothes, however do keep the strings properly tied and well secured. People with long hair should tie it back so that it does not hang above the flames. Appropriate oven mitts are also advisable to avoid burning the hands. A grill’s fire can very quickly increase in temperature and become out of control if the grill owner does not know how to handle it. In the event of flare-ups, one effective way to cope with it is by placing the grid at a higher level. Alternatively use a long-handled tool to disperse the coals so that the heat is not focused on one central area. 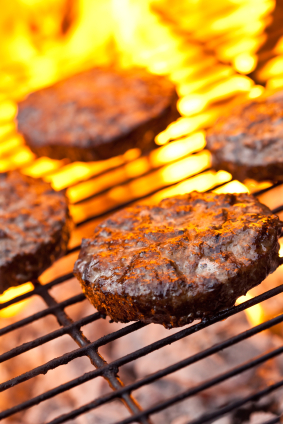 Another method is to simply use the grill controls to maintain a lower temperature. For larger flames quickly but carefully move the food off the grill, and then sprinkle a little water over the coals. Even advanced grillers should be properly equipped in case a fire gets out of control. To this end, a fire extinguisher is vital to have next to the grill. Adults in the family should be familiar with using a fire extinguisher and know how to deploy it at a moment’s notice if necessary. In lieu of a fire extinguisher, a garden hose can work just as well if it is easily within reach. Another simple but effective remedy is a box of baking soda for extinguishing grease fires caused by food. Keep a waterproof, sealed container of sand nearby as well to smother the flames in an instant.